Turn an ordinary breakfast into something a bit more extraordinary by switching up an ingredient or two. 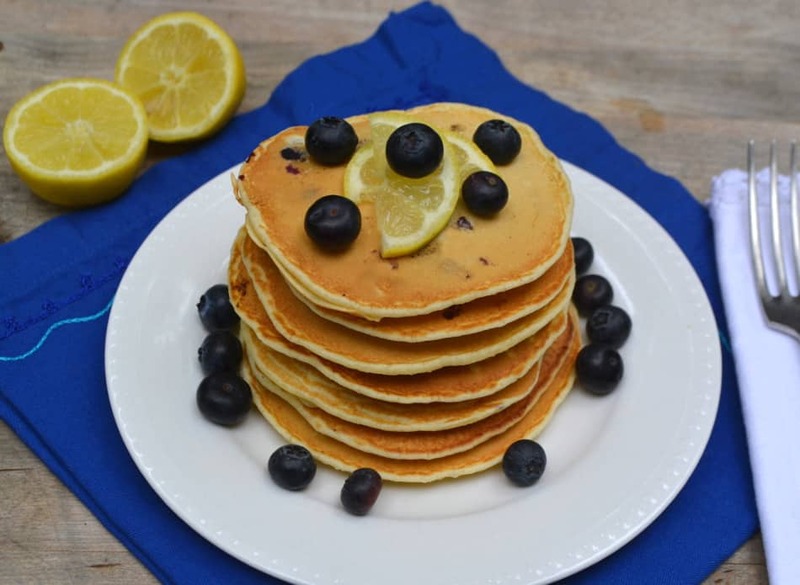 These Blueberry & Lemon Olive Oil Pancakes mix it up just enough. I was provided with a free product to sample. I was not financially compensated for this post. All thoughts & opinions are always my own. I was recently sent a few olive oils to taste from Pomora. I fell in absolute love. The lemon olive oil is so interesting and I just keep finding uses for it. Drizzled over asparagus and veggies, yes. Drizzled over a simple seafood pasta dish, yes. Drizzled over a salad, yes. It added such brightness to every dish. I often find myself taking simple recipes and changing one or two main ingredients. Pancakes are a great example. 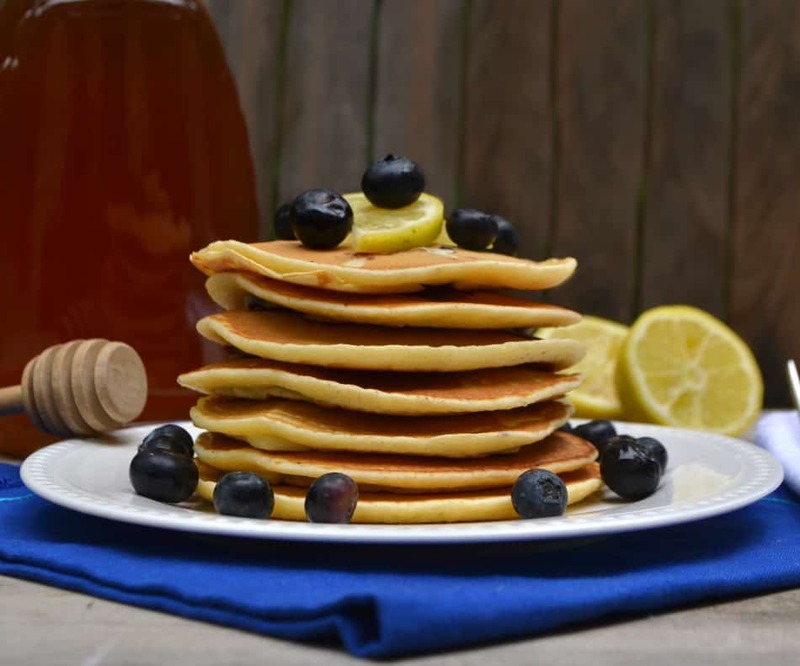 When you think of the flavor of pancakes you think vanilla, butter and maple syrup. I used a simple pancake recipe, skipped the butter and vanilla and subbed it with the lemon olive oil. 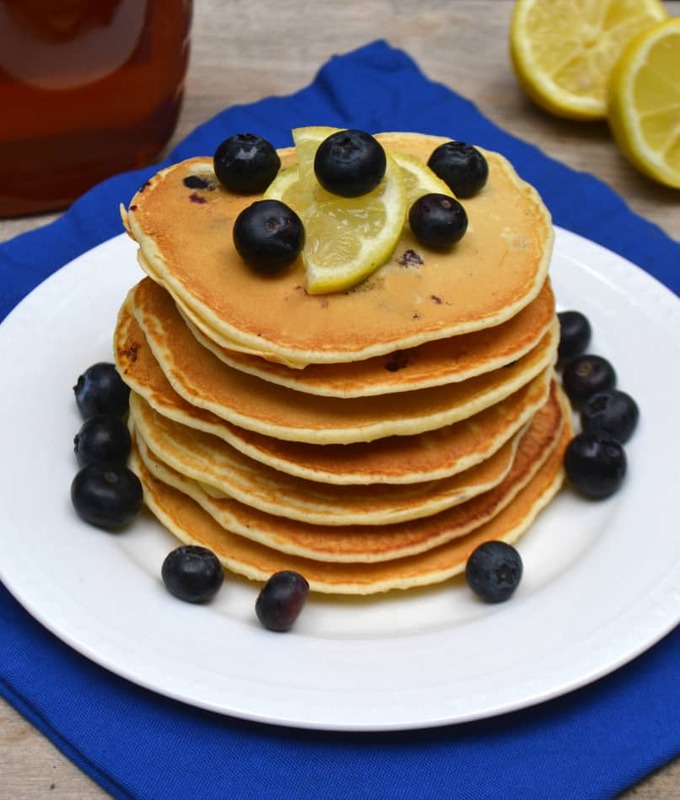 It livened up ordinary pancakes, adding a unexpected but welcoming change to pancakes. I served raw honey alongside these pancakes for drizzling. The sweet and savory uses for this oil are endless. I’m looking forward to making a simple custard or panna cotta and drizzling it with lemon olive oil. Pomora has created an “Adopt An Olive Tree” program where you receive four shipments a year from your tree. These oils come from gold-medal winning, independent family growers. The flavor of the olive oil will vary each shipment – the tastes are wondrously unique to each season. You can read extensively about where your olive oil comes from. Learn about Carmelo and his oil from Sicily and Antonio and his olive oil from Campania. It’s really an interesting read – check it out! 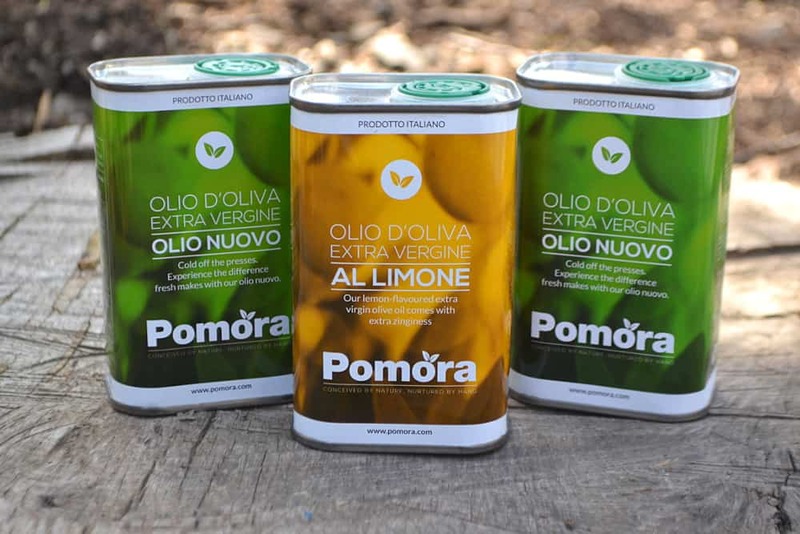 Learn more about Pomora – who they are, what they stand for and their passion for olive oil. In a large mixing bowl - whisk together flour, sugar, baking powder and salt. Set aside. In a separate mixing bowl, whisk together milk, eggs & olive oil. Whisk wet ingredients into dry ingredients until just combined. Pour pancakes, I use about 1/4 cup ladle, onto a greased or non-stick griddle over medium-high heat. Cook until each side is golden brown, about 2-3 minutes. I never thought about putting olive oil in pancakes. That’s a great idea. They look so yummy. 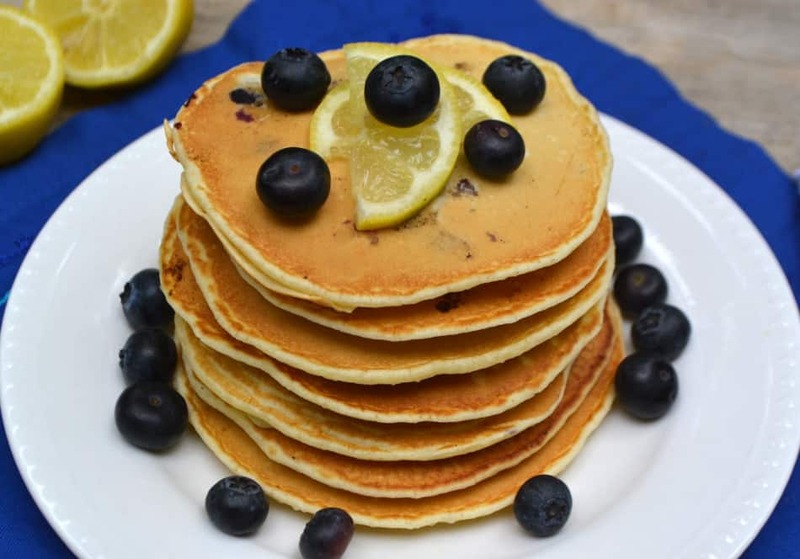 These pancakes look absolutely delicious, Amanda! I can put a pretty good dent in this stack! Swapping out the butter and vanilla with the lemon olive oil is a fantastic idea, not to mention that it’s also healthier. I just read up on the Adopt an Olive Tree program. It is such a wonderful way to support small independent farmers and receive quality products from Italy. Plus, you know the olive oil is going to be good! These pancakes look amazing. The lemon olive oil sounds wonderful!! 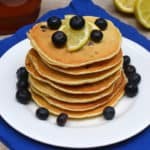 I would love these for breakfast!